When an opportunity arose to invest in a local run-down sawmill in Mangawhai, we snapped up the opportunity. Not only did it complement our existing Orang-Otang Tree Trimmers business, but it meant we could fully utilise the trees we removed. After spending numerous hours transforming the land back to its former glory, we ventured out and purchased a Mahoe Super Mill. 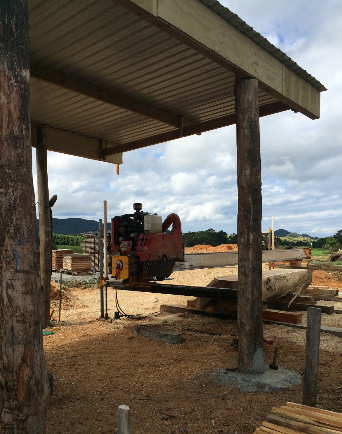 The in-house, purpose-built sawmill is ideal for custom milling and enabled us to open up to a market in Mangawhai for rustic furniture with a focus on Macrocarpa and Pine, we’ve never looked back. We supply outdoor and indoor furniture, garden sheds, sleepouts, planter boxes and plenty more. The Mahoe Super Mill has a (12 x 10 cut), a slabbing bar that can cut 1.5 metres wide as well as having a log splitter allowing us to price our products extremely competitively. Having a Mahoe Mill allows us to custom cut to your requirements.